The Caresens N blood glucose monitor has received recognition for its high quality and user-friendliness. It uses a very small sample size of 0.5 microliters (0.5 ㎕), which is great considering how fine a cat’s ear is, and it has a 5 second test time, so you get the results almost instantly. The CareSens N includes proprietary auto-coding technology, for which i-sens (the manufacturer) has received the Frost & Sullivan ‘2009 Asia Pacific Excellence in Healthcare Award’. This has placed the CareSens N blood glucose monitor among the top products of its kind in the world. We choose the Caresens N Glucose Meter because it was designed using cutting edge technology, as well as the accuracy and speed with which it delivers the readings, and the sleek and stylish design of the unit. CareSens N meets ISO15197:2003 (the current international performance standard for blood glucose monitoring systems). The CareSens N Blood Glucose Monitor uses CareSens N Blood Glucose Test Strips. 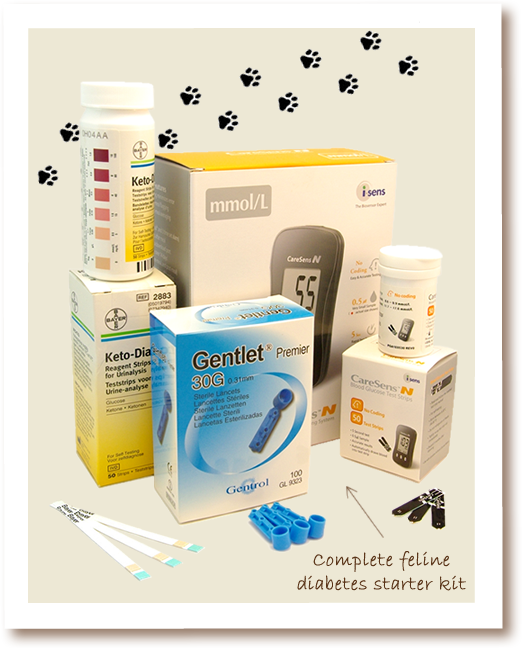 There are also alarms that you can set to remind you to test your cat's blood glucose. With the press of one button you can set an alarm to go off in two hours, and there are also three other alarms that can be set for whatever time you like.